What's the expected HP of a TPC supercharger on a 95 c4 cab? 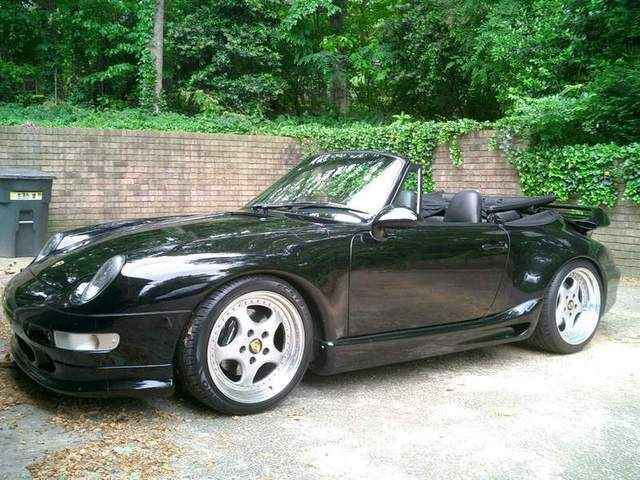 The supercharger adds about 90-100 crank HP to your 993. Awesome car man! Those are my fav sideskirts... from the pic of my car you can see why =O) Mine too are all Gemballa (exterior) mods. I currently have about 450HP with my setup. I pretty much walk stock 996 turbos and I beat my friend's X50 996 Turbo by a car and a half. Having experience with building up my project... If you want 450+ HP sell your car and buy a turbo and chip it. So the reason that your saying look at a turbo is 'cause of cost savings? The only thing is that you can't get a cab in the turbo. One reason I bought a '95 C4 Cab. Super charging is new to me so im very intreagued! I almost did it to my 540i sport but I decided to go Porsche. Whats your 0-60 and other specs? Don't worry you made a good choice going with the 993. You might want to consider a suspension upgrade after this mod. I also wouldn't do the supercharger if you have a less than perfect motor. It should be strong and well maintained. Have your valve guides checked etc. On my strong stock motor my rods were stretching under pressure. You can change the rod bots to ARP or just get a set of Pauter forged rods. Last edited by rsquad911; 01-16-2007 at 08:00 AM.. Check tthe TPC website for all the exciting details. Has anyone checked their air fuel ratio (AFR) using a wideband O2 after installation of the supercharger? I am curious to see what everyone else is seeing with a computer tuned by TPC (split second or uni-chip). After installation of the Fabspeed bypasses while still running the split second box, I was seeing AFR's of 12.5 -12.8 on wide open throttle (using a new Inovate LM-1) . This concerned me so I decided to wait until I installed the uni-chip to retest the car. Now with the uni-chip, 6lb pulley, and bypasses, I am still seeing high 12's on WOT. I talked to Tom at TPC this morning who told me that this sounded fine to him and that anything up to 13.0 when measured through the left exhaust pipe sounded fine to him. He said that on these cars typically the right bank of cylinders would run richer and should show a 12.5 on that side. I plan to post more about my initial impressions of the upgrade but am limited in time right now. This weekend, I plan to replace my fuel filter, clean the AFM, and possibly replace the fuel pump. I recently upgraded my TPC supercharger to the latest version (changed to a smaller pulley/ belt, change the injector, and re-wired everything) as well as had a new SPEC clutch and lightened flywheel installed. Runs like a champ but every now and then when I need to stop for a red light or stop sign, it stalls as I engage the clutch and come to a stop. I know the kinetic energy is a lot less with this flywheel vs. stock so do I need to take it to a tuning shop to change my idle position or is there something they can do to the computer to alleviate this problem? Have you installed a wide band to see what your air fuel ratio is??? Just interested in what TPC is shooting for in there tune. Also does your car have a "pop off valve". if so it might be leaking to cause your stalling problem. BTW an A/F of 13.0 is not good for a forced induction car IMO. Last edited by cturbo28; 01-19-2007 at 06:50 PM.. I'm using an AEM wide band AFR gauge at all times when drivin gmy car. I also have on order the Andial Intercooler temperature gauge to keep an eye on my intake temps. Should be 130*F or lower. My intercooler keeps that in check. I want to do some more extensive tuning on my car getting a tighter AFR of 12.5-12. I need to find a dyno that is sutiable for the air cooler 993 engine. Anything close to 13AFR I'd be scared! When I was using the Split second box on my 993 when it was stock I have AFR spikes of 14! Way too lean. Engine bogged and felt like _ _ _ T. All the tuning in the world couldn't fix the problem. Ended up going Unichip and things are great now. Thanks for the replies. I was able to sort out my lean condition and now have AFM's beween 11.3 and 12.0 under WOT. On the stalling issue, I agree with Cturbo. I was told by TPC to keep the pop off valve in place but stack washers under the spring to keep it from opening under boost. We found out that the unit was still leaking at idle causing the system to take in extra air that was not being metered by the AFM. With this leak fixed, the transition to boost is much smoother and the car has not yet stalled even with the lightweight flywheel. You may need to put a caps on both pop off valve ports to ensure that the unit is not letting in air at vacuum. What was the cause of the lean condition? What sort of AFR are you seeing at redline? ?